Israeli soldiers invaded, on Sunday at down, several Palestinian communities in the southern West Bank city of Hebron, searched homes and kidnapped six Palestinians, including three siblings, between the ages of eleven and sixteen.Eyewitnesses said several army vehicles invaded Sa’ir town, northeast of Hebron, and kidnapped Mojahed, 16, Qussai, 15, and Sa’ad Nimir Froukh, 11, before taking them to the Etzion military base. The kidnapped children are the cousins of Fadi al-Froukh, 27, from Beit Anoun town, east of Hebron, who was killed by Israeli army fire, on Movember 1, 2015, after an alleged stabbing attempt targeting Israeli soldiers. 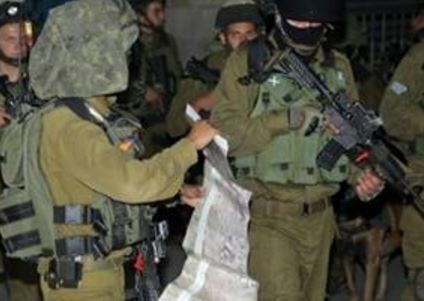 The soldiers also invaded homes in Hebron city, and kidnapped a former political prisoner identified as Dr. Amjad al-Hammouri, 39, in addition to Islam Yassin al-Karaki, 18, and Moath Ahmad Shabana, 18. In addition, the army invaded the home Shadi Ghalama, from Hebron city, and summoned him for interrogation in Etzion base. The Palestinian is a former political prisoner, who spent 18 years in Israeli prisons, detention and interrogation facilities. In Bethlehem, the soldiers invaded the Deheishe refugee camp, south of the city, broke into homes and summoned two Palestinians for interrogation in the Etzion military base. They have been identified as Amer Sami Hajajra, 35, and Nidal Mohammad Obeid, 24.